Explore new ways to use oyster sauce! 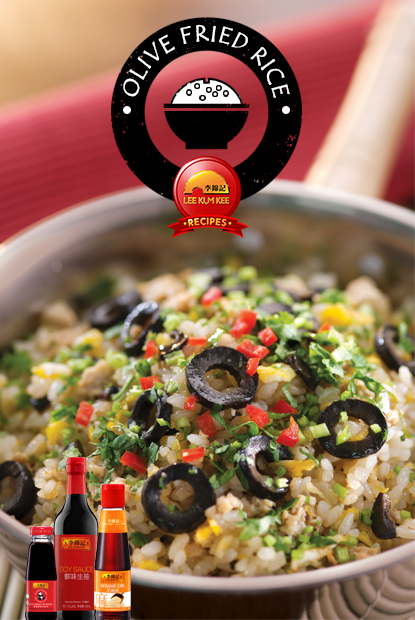 Since the Chinese olives used in this recipe are already salty and flavourful, the seasonings are minimal. 1. Chop the olives into small pcs and mince the chicken breast. 2. Add oil to the wok. Add chopped garlic and stir. Add chopped olives and fry until fragrant. Put in the minced chicken, Panda Brand Oyster Sauce and dark soy sauce. Stir well. If there’s a lot of juice coming out from the chicken, keep stirring until the juice is gone. Remove and set aside. 3. Heat wok with 1 tbsp of oil. Add in the egg and stir. Add in rice and soy sauce and continue frying. Add in the cooked olives with chicken. Put pepper and pour sesame oil and stir. The rice should turn a little purple. 4. Place cooked rice on a plate and top with parsley. Enjoy!